Minor surgical procedures involving the teeth, gums and jaw bone may be needed to preserve or enhance the long-term oral health. While our philosophy is to do our best to maintain your teeth, each situation is unique and needs to consider all factors involved. When our discussion together leads to a surgical correction, Dr. Lasley will take every step necessary to ensure your comfort and safety. A damaged tooth may need removal if it’s beyond repair. We also understand patients sometimes choose to remove a tooth due to financial limitations. We’ll always work hard to help you find the solution that fits every aspect of your situation. Regardless, Dr. Lasley uses the best methods and equipment to provide a quick and painless visit. Fortunately, Dr. Lasley also provides sedation options that can provide you a stress-free procedure that you may wish to consider as well. Dr. Lasley will determine right along with you, the best avenue of care for your unique situation. On occasion, we may recommend a referral to a trusted specialist. Any time we feel you’ll be served best by a colleague trained in a particular treatment, we won’t hesitate to use the best resources that maximize your benefit. Despite your best efforts, teeth sometimes need to be extracted to protect your overall health. After discussing all other possible treatments, and you’ve decided on extraction, we’ll take every step to help you. Your well-being is our top priority in any treatment decision. Some patients prefer sedation to help with oral surgery, and we can include medicated options into your plan. In any case, we take every measure to ensure even minor surgical procedures as comfortable and as stress-free as possible. Teeth present varied levels of removal difficulty, but the Carey V. Lasley team takes pride in helping every patient get through their procedure with confidence. Once anesthesia takes effect, careful steps are taken with instruments designed to elevate your tooth out of place. Specific instructions will be provided to you to help you care for the area after your procedure, with prescriptions for any medications needed during the healing period. While we do consider the short-term management of your oral health, we should also discuss your long-term plans for replacing missing teeth. Leaving a space is always an option, but spaces in your teeth can create appearance and functional challenges that are important to consider. 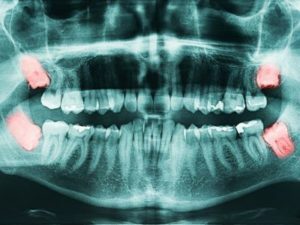 Teeth slowly shift or migrate into open spaces, and minimizing the instability of an unbalanced bite can save a number of complications later in life. Missing teeth can also effect bone loss in your jaw. In many cases, dental implants are a perfect solution to missing teeth. Before removing a wisdom tooth, Dr. Lasley will give you a local anesthetic to numb the area where the tooth will be removed. Oral conscious sedation will be used to help you breeze through the appointment, often with no memory of the procedure. To remove the wisdom tooth, Dr. Lasley will make an incision in the gum tissue over the tooth and take out any bone that is covering the tooth. He will then separate the tissue connecting the tooth to the bone and then remove the tooth. Sometimes its necessary to cut the tooth into smaller pieces to make it easier to remove. After the tooth is removed, you may need stitches. Some stitches dissolve over time and some have to be removed after a few days. Dr. Lasley will tell you whether your stitches need to be removed. A folded cotton gauze pad placed over the extraction site and will help stop the bleeding. In most cases, the recovery period lasts only a few days. Take painkillers as prescribed by your dentist.